The WakaWaka flashlight and solar chargers harness photovoltaic technology to bring the sun’s power into dark places. WakaWaka is a social impact company whose solar-powered products were initially funded by a successful Kickstarter campaign. Their flashlights and chargers are now in production and available for purchase, and their “buy one, give one” program brings thousands of hours of light and power to communities in need. Their core product, a solar-powered flashlight, provides up to 80 hours of illumination from a single day (5 to 10 hours) of charging in the sun. It’s a sturdy water-resistant yellow box, with solar panels on one side, and two bright LED bulbs on the other. Shaped like a cell phone, it can be used comfortably as a handheld flashlight, but it also has a base that flips out from its body and acts as a stand, turning it into a tabletop lantern. 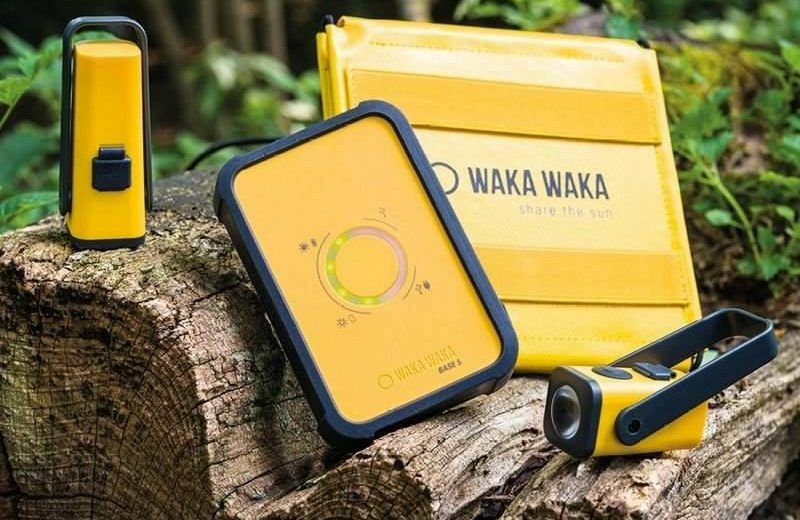 Their product line also includes a portable solar-powered charger, called the WakaWaka Power+, which is a flashlight very similar in design to the WakaWaka Light, but with a USB power port built into the body for easy recharging of small electronic devices. It can be brought to a full charge with 12 hours of sunlight, and can provide up to 120 hours of flashlight or lantern use on its dimmest setting. It can also be plugged into AC power to recharge its battery via a micro USB port. It’s impact-resistant and can completely recharge an average cellular phone in approximately two hours, making it a very useful tool to have around for camping, hiking, and emergency kits. WakaWaka also makes compact solar power stations, which it calls the WakaWaka Base. There are two versions, a Base5 and a Base10, which differ in how much power they can store. Because of advanced solar panels used in the design, the Base5 only needs 4 to 8 hours in the sun to return to a full charge, and then it can provide multiple phone charges or an entire week’s worth of light. The kit comes with a small fold-out solar array, flashlights, and a power base with built-in USB ports, and also includes a carrying case to store it all. Buying a WakaWaka light doesn’t just help you to see better in the dark – for every light or charger purchased, one is donated to the humanitarian organization International Rescue Committee, who then gets them to families who need them. And the buyer has a say in where the donation goes: a unique “Give Code” is included inside the retail packaging of every WakaWaka Light and WakaWaka Power+ device. That code can be redeemed to allow the buyer to select a destination country for the donated product. With lights like these that can be easily recharged by the sun even on cloudy days, communities can scale back their use of kerosene and other similar fuels, having a huge positive impact on their health and safety. To date, WakaWaka has met and surpassed its Clinton Global Initiative (CGI) commitment to empower one million people living without access to electricity with life-saving, life-enhancing solar lights by 2016. Giving more than 215,000 lights and power, providing solar powered solutions to developing countries such as Haiti, Syria, Mali and Liberia to name a few, living without electricity and bringing an end to the kerosene lamps.